NEW ORLEANS, La. 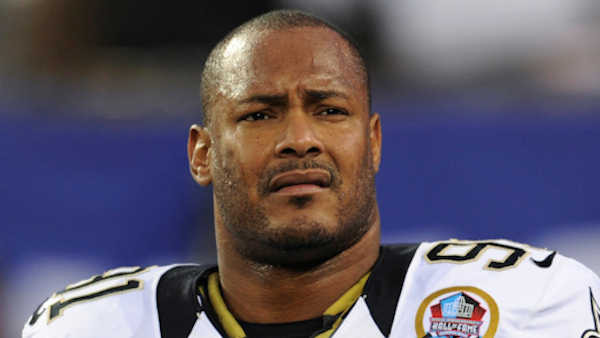 (WABC) -- Former New Orleans Saints player Will Smith was shot and killed in a case of road rage by a man who had rear-ended his car, police said Sunday. Smith's slaying rippled across the sports world, with figures from NBA star LeBron James to NFL Commissioner Roger Goodell offering their condolences. James said on Twitter: "So sad man. Good dude he was man!" There was no indication Smith, 34, knew 28-year-old Cordell Hayes before the deadly confrontation, or that anything except the car wreck led to the shooting. Hayes waited for police to arrive after the shooting and was arrested on a charge of second-degree murder. Police Superintendent Michael Harrison would not say whether Hayes claimed self-defense, citing the ongoing investigation. Harrison said the former defensive end had dined just hours before the Saturday night crash with a police officer who had once been sued by Hayes, whose father was shot and killed by police in 2005. However, it was not clear if that played any role in the confrontation. Hayes' Humvee H2 rear-ended Smith's Mercedes G63 about 11:30 p.m. Saturday in the upscale Lower Garden District, pushing it into a Chevrolet Impala driven by two of Smith's acquaintances. The two argued, and Hayes shot both Smith and Smith's wife, Racquel, police said. She was wounded in the leg and taken to a hospital. The Smith family said in a statement that they were thankful for the outpouring of support but requested privacy as the family grieves for a "devoted husband, father and friend." Will and Racquel Smith have three children. The couple had been at the French Quarter festival, an event that features local music and food, in the hours before the shooting. He posted a photo of himself and his wife on Twitter and Instagram with the caption: "Having a blast at the #fqf2016 French Quarter Fest." He sued the New Orleans Police Department and six officers after police killed his father in 2005. The former officer who dined with Smith, William Ceravolo, was not present at the time of the crash, police spokesman Tyler Gamble said. Ohio State athletics has "lost one of its best" - someone who led a defensive line that powered the team to the championship, the school said in a statement. Smith was a first-round draft choice by New Orleans in 2004. He led the Saints with a career-high 13 sacks in 2009, when the club won its only Super Bowl. Smith's 67 career sacks rank fourth in Saints history. Off the field, Smith took an active role in trying to improve children's lives, establishing a foundation called, Where There's A Will, There's A Way. Its stated mission is "to motivate, educate and provide opportunities for women and children." "The Saints family is hurting and devastated as it has lost a member too young and too soon," Saints owner Tom Benson said in a statement.